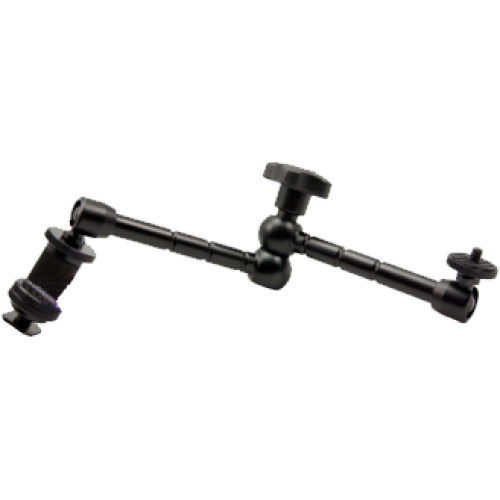 11" articulating magic arm with ¼ inch BSW thread and shoe mount adapter. Compatible with Lilliput monitors. · The perfect accessory for professional video customers looking to mount their Lilliput HDMI monitor on their camera. · Secure: a sturdy and durable aluminium mount between your camera and monitor. · Flexible: our articulating arm is great for shoots where multiple people need to see the monitor. The pivot can be positioned to lots of different angles. · ¼ inch BSW thread is compatible with most Lilliput monitors - please call us on 0845 0068868 to confirm compatibilty with your Lilliput monitor. The Lilliput 569-O/P is a 5" widescreen LCD field monitor with HDMI, component video and composite i.. The Lilliput 5D-ii/O/P is a 7" widescreen LCD field monitor with HDMI input and loop throu..
***LIMITED STOCK AVAILABLE - WHEN ITS GONE, IT'S GONE!! ***The Lilliput 664 monitor is a 7 inch 16:9 .. The Lilliput 663/O/P2 monitor is a 7” widescreen LCD field monitor with HDMI, YPbPr (via BNC) .. The Lilliput 663/O/P/S2 monitor is a 7” widescreen LCD field monitor with 3GSDI, HDMI, YPbPr (.. The Lilliput 665-P/WH is a 7 inch widescreen wireless LCD field monitor with WHDI receiver. For wire.. The Lilliput 339 monitor is a 7 inch 16:9 LCD field monitor optimised for DSLR camera sys.. The Lilliput 664 monitor is a 7" widescreen LCD field monitor with HDMI, Composite video inputs.. The Lilliput 665-O/P is a 7" widescreen LCD HD field monitor with HDMI, component video in.. The Lilliput 667GL-70NP/H/Y is a 7" widescreen LCD field monitor with HDMI, component, and comp.. The Lilliput 668GL-70NP/H/Y is a 7" 16:9 LCD field monitor with built-in battery, HDM.. The Lilliput 665/O/P/S is a 7" widescreen LCD HD field monitor with SDI, HDM.. The Lilliput 667GL-70NP/H/Y/S is a 7" 16:9 LCD field monitor with SDI, HDMI, component, and com.. The Lilliput 665/O is a 7" widescreen LCD HD field monitor with HDMI, component video.. The Lilliput 662/S monitor is a 7" widescreen metal framed LCD field monitor with 3G SDI and HD.. The Lilliput Q7 monitor is a 7" widescreen metal framed LCD field monitor with a full 1920x1200.. The Lilliput Q5 monitor is a 5" widescreen metal framed LCD field monitor with a full 1920x1080.. The Lilliput RM-Q7 monitor system is a 19" Rack Mount monitor system available with either a single ..